Henry Byron Warner (born Henry Byron Lickfold, 26 October 1876 – 21 December 1958) was an English film and theatre actor. He was popular during the silent era and played Jesus Christ in The King of Kings. In later years, he successfully transitioned into supporting roles and appeared in numerous films directed by Frank Capra. Warner's most notable role to modern audiences is "Mr. Gower" in the perennially shown film It's a Wonderful Life, directed by Capra. He also had a cameo in Sunset Boulevard, directed by Billy Wilder. Born in St John's Wood, London, England in 1876, H. B. Warner was educated at Bedford School. His father, Charles Warner, was an actor, and though young Henry initially thought about studying medicine, he eventually followed in his father's footsteps and performed on the stage. He had an older sister, Grace Warner (1873-1925), who was a stage actress and manager. Warner's stage debut came in It's Never Too Late to Mend when he was 21. He acted in a several plays before coming to the United States for the 1905-1906 season. 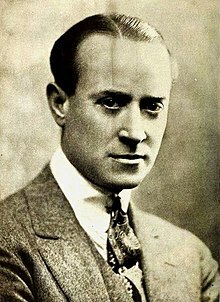 His Broadway credits include Silence (1924), You and I (1922), Danger (1921), Sleeping Partners (1918), Out There (1917), and Blackbirds (1912). H. B. Warner began his film career in silent films in 1914, when he debuted in The Lost Paradise. He played lead roles in the silent era and also appeared in numerous Broadway plays. His greatest success was the role of Jesus Christ in Cecil B. DeMille's silent film epic The King of Kings in 1927. He received good reviews for this role, but with the advent of sound era, he turned towards supporting roles, mostly because of his age. He usually was cast in dignified roles in numerous films of the 1930s and 1940s. He played in the 1930 version of Liliom (as the Heavenly Magistrate), in Five Star Final (1931, as Michael Townsend), in Grand Canary (1934, as Dr. Ismay), and the 1935 version of A Tale of Two Cities as Gabelle. He also portrayed the strict judge in Mr. Deeds Goes to Town (1936) with Gary Cooper and Jean Arthur. He appeared in the original 1937 version of Lost Horizon as Chang, for which he was nominated for the Academy Award for Best Supporting Actor. Among his later films were You Can't Take It With You (1938), Mr. Smith Goes to Washington (1939), The Rains Came (1939), and The Corsican Brothers. In It's a Wonderful Life (1946) he played what was for him an atypical role, as the drunken druggist. Occasionally, Warner was seen in sinister roles, as in the 1941 film version of The Devil and Daniel Webster, in which he played the ghost of John Hathorne. Also that year he played the villainous role of Mr. Carrington in Topper Returns. He also appeared in Sunset Boulevard (1950) in which he played himself, playing cards with some other former silent film stars including Buster Keaton and Anna Q Nilsson. His last film role was an uncredited cameo in Darby's Rangers (1958). Warner was married twice, first to the former Mrs. F.R. Hamlin who died in 1914 and from 1915 until 1933 to Marguerite L. 'Rita' Stanwood. On 21 December 1958 Warner died in Los Angeles, California of a heart attack, and is inurned in a private vault at the Chapel of the Pines Crematory in Los Angeles, California. For his contributions to the motion picture industry, Warner has a star on the Hollywood Walk of Fame at 6600 Hollywood Boulevard. In the 1916 silent drama "The Beggar of Cawnpore," H. B. Warner is Dr. Robert Lowndes, a British army doctor in India reduced to wild eyed beggary by morphine addiction. ^ a b Fisher, James; Londré, Felicia Hardison (2009). The A to Z of American Theater: Modernism. Rowman & Littlefield. p. 506. ISBN 9780810868847. Retrieved 18 December 2016. ^ Briscoe, Johnson (1907). The Actors' Birthday Book: First -third Series. An Authoritative Insight Into the Lives of the Men and Women of the Stage Born Between January First and December Thirty-first. Moffat, Yard. p. 235. Retrieved 18 December 2016. ^ "("H.B. Warner" search results)". Playbill Vault. Retrieved 18 December 2016. Wikimedia Commons has media related to H.B. Warner. This page was last edited on 15 April 2019, at 16:02 (UTC).